It may sound too good to be true that you can have your own Hollywood smile with no pain, no drilling, and no grinding down of your teeth. But the revolutionary development of DURAthin veneers makes that offer available. Tennessee dentist Dr. Dennis Wells, in connection with his lab technician Mark Willes, designed and developed DURAthin veneers to restore and craft beautiful smiles without the damage to your natural teeth that many other cosmetic restorations require. If you wish you could change something about your smile, but don’t hate it enough to want a complete smile makeover, DURAthin veneers offers a more conservative solution that is just as aesthetic. You can have a Hollywood smile without all the pain and irreversible tooth reduction. Like traditional porcelain veneers, DURAthin veneers can hide unsightly teeth, resize small or misshapen teeth, whiten slight discoloration, and straighten your smile for a beautiful look. They offer an excellent all-in-one solution for several common aesthetic problems with smiles today. Tennessee DURAthin veneers are much thinner than porcelain veneers, allowing them to bond directly to the front surface of the tooth. With traditional porcelain veneers, the dentist has to grind down the natural teeth to compensate for the added thickness of the veneer. With DURAthin veneers, you can have a beautiful new smile while preserving your teeth underneath. Cosmetic dentist Dr. Dennis Wells points out that not everyone is a good candidate for DURAthin veneers. This cosmetic dental technique is designed for specific cases and may not be the solution for every dental need. At an initial consultation with Dr. Dennis Wells, he will assess your situation and together you will determine whether DURAthin prepless veneers are the best option for you. 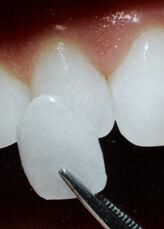 If you do not qualify for DURAthin veneers, other cosmetic dental techniques such as dental crowns or traditional porcelain veneers offer equally beautiful smiles. To learn more about how DURAthin veneers can give you the Hollywood smile you want, call the Nashville Center for Aesthetic Dentistry at 615-371-8878 to schedule an initial consultation with cosmetic dentist Dr. Dennis Wells.